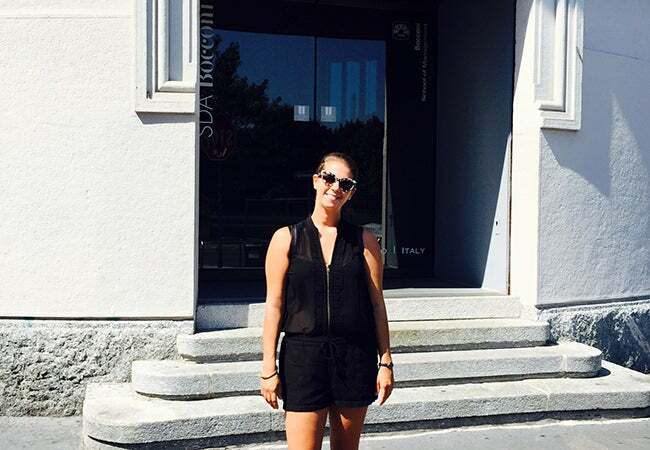 MBA student Becky Malik blogs about her experience studying abroad in Milan. Although weekend travels are undoubtedly an incredible benefit of living abroad, establishing my daily routine here has given me even more pleasure. 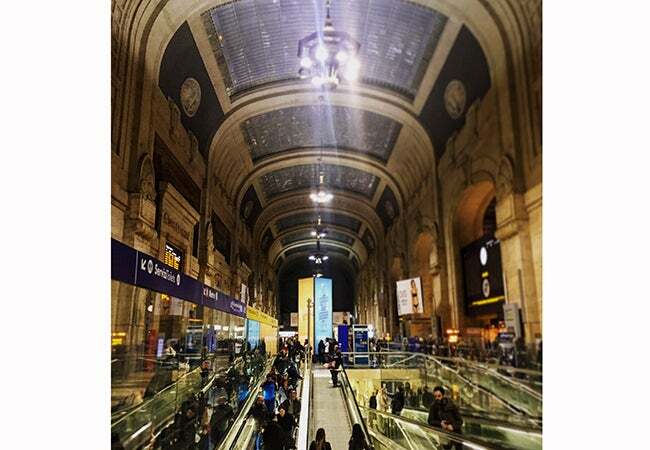 The feeling I have when returning to Milan on Sunday nights is arguably my favorite: As soon as I reach Malpensa (the airport) or Centrale (the train station), I truly feel like “I’m home.” The energy is Milan is different – I can put the guide maps away, and everything is familiar. As I make my way to my apartment door and collapse into my bed, I am left energized and ready for another full week of class and la mia dolce vita milanese. The familiar sight of Milano Centrale, the main train station, as I head underground to the metro. My daily routine has numerous highlights. I am awoken every morning to the sound of church bells from the bell tower adjacent to my bedroom. Although they are never on time (almost always late like most things in Italy) and the sloppy chimes are actually quite cacophonous, I love them nonetheless. As I make my way to school, I enjoy my fifteen-minute walk across cobblestone streets and two canals, smiling at the same young children each morning as they walk to school in their uniforms, their hands tightly grasped by their parents as they traverse the stairs along the bridges. From elementary school to graduate school, we all start promptly at 8:30 am, and, when we are running late, we exchange understanding grins as we scurry past one another. Midway through classes for the day, we break an hour for lunch and choose from the many quick, affordable, and eclectic options in the neighborhood such as burgers, gyros, sushi, and of course, pasta. The staff is always waiting for us, recognizes us as students and therefore gets us ridiculously prompt service for Italian standards, and then lets us pay separately in cash as we dash out the door. It’s been a wonderful opportunity for me to bond with classmates and we often meet to discuss our group projects or make plans for the weekend. I even have a loyalty card at the Japanese spot and am only a few punches away from a free meal! On my way home after class, I often stop at my local mercato to pick up fresh vegetables and pasta, the macelleria for semi-prepared proteins, the enoteca for wine and the forno for focaccia or sweets. 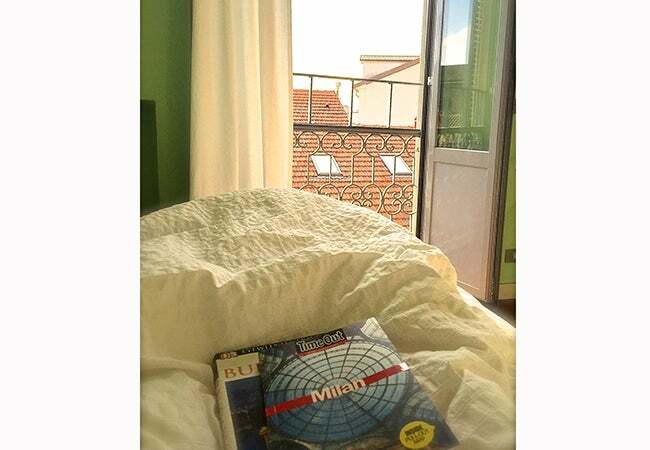 I like to spend the early evening finishing my readings for school or researching my next trip with the sunshine and the sounds of motorbikes and the tram, conversations at the café and suitcases rolling on the street below flooding through my Juliet balcony. When I’m ready for dinner, I find creative ways to use my stovetop, as I do not even have an oven, let alone a microwave. Although my culinary preparation options are limited, I’m still eating some delicious Italian meals at home on nights that I’m not meeting friends out for aperitivo (happy hour, starting at 6 pm) or dinner (starts at 7:30 at the earliest but locals generally eat after 9 pm). I have an unlimited amount of dining options in my neighborhood, but I still return to my favorites frequently and am sure to have reservations confirmed for the best when friends are in town. 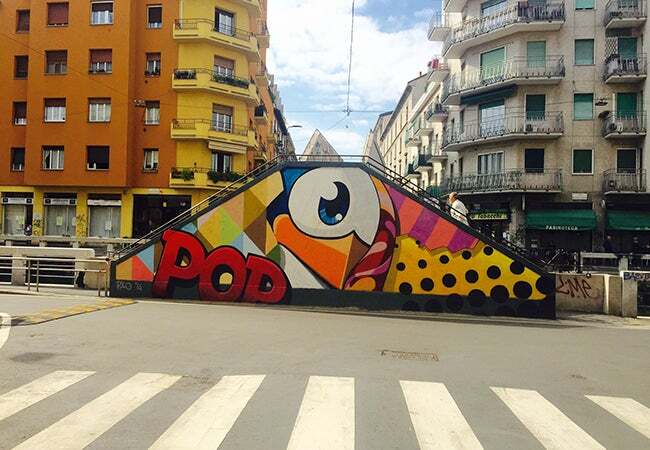 Street art adorning a bridge crossing one of the two canals on my way to school. Enjoying the sights and sounds from my window while reading in bed in the early evening. 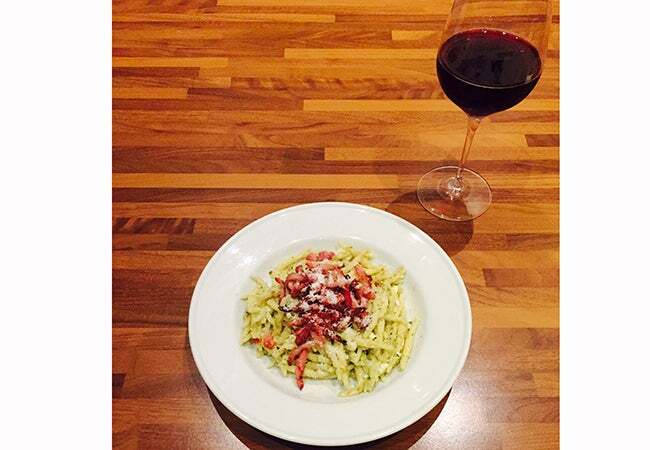 One of many homemade meals enjoyed in my kitchen: trofie al pesto genovese con pancetta and a glass of Lambrusco. 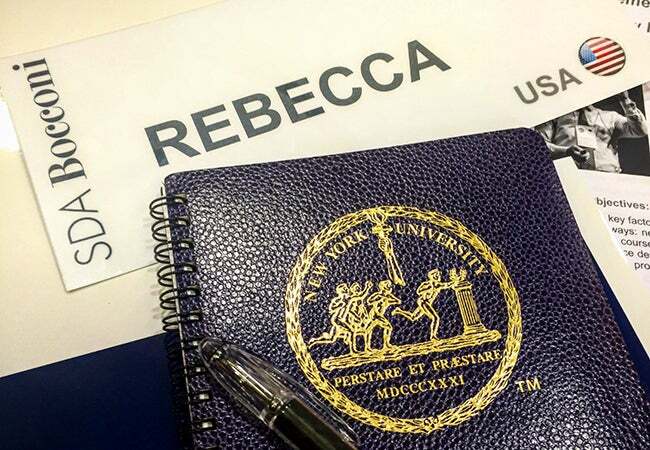 Bocconi has also been a great experience. As an exchange student from Stern, I am taking a full course load in the MBA program, known as SDA (Scuola di Direzione Aziendale). MBA students share the same building with the MAFED program (Master in Fashion, Experience & Design Management) as well as the luxury track students, who have their own small classes and designated internships. However, there are some professors who teach classes to both groups, and the career services team helps facilitate great connections with the industry for all MBAs, including a Luxury Career Day I attended this month with company presentations and networking opportunities. Some other exchange students also take management courses at the University, a few blocks away on campus. The overall student makeup is only about 25% Italian, and the remainder is international. There are many students from throughout Europe but also a strong presence from both South America and Canada. Because the student body is so diverse, they are very welcoming to exchange students, and it has been very easy to participate in the classroom and get involved with extracurriculars. I am enrolled in 15 credits, with five classes in two blocks lasting five weeks each. I am focused on the Innovation and Marketing concentrations, which are dominated by group work, special guests and company visits. Our final week in each block is dedicated to our finals, which are often group presentations or case simulations. We’ve had amazing guest speakers; my favorite has been the CEO of Valentino Group who showed us some behind-the-scenes design and runway videos that gave me chills. We have also visited some really interesting companies such as Nestle Italia and N&W, a vending company specializing in IoT innovation where we got to tour the production line in the factory. The Italian professors are very animated – they use their hands, walk around the room, joke around with students – and sometimes their accents can be quite comedic! It took me almost 60 seconds to figure out one professor was saying “matrix” when what I heard was “mattress.” I expect I will look back on the littlest of things like that in the classroom in the years to come with some of the fondest memories of my time here. With only one more month to go before I finish school forever, I’m enjoying each passing class with great appreciation. 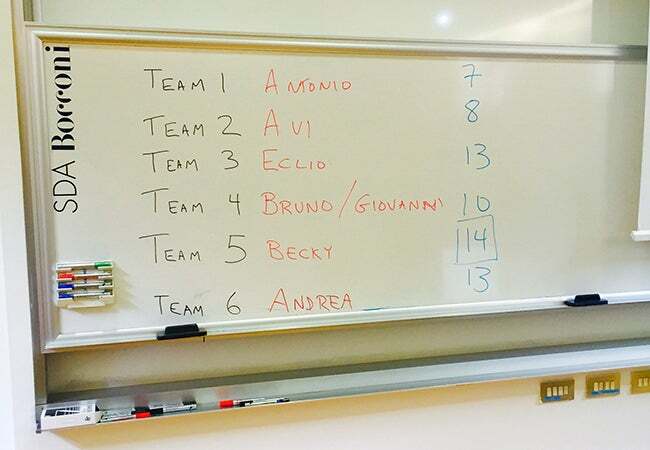 The scoreboard for a competition I won in class!